First of all, the customer service of Thomann is super. On Sunday, 3 days before New Year's Eve, ordered, with the remark that I must have the set up New Year. On Monday morning came the mail from the customer service and told me that the set was already shipped by Expressspedition. TOP! The delivery was really surprising. A large black tower, 1 1/2 meters high on a small pallet, was unloaded by a pallet truck and placed directly in my garage. Briefly placed a signature and then I stood there. Knife cut, the black plastic foil cut through and 4 packages appeared. On top of that a unfortunately slightly deformed carton, because underneath a normal large square cardboard without damages, one floor deeper a large cardboard and at the side still an elongated carton. All on a small wooden pallet. But now, quickly, it was cold outside. First of all, the small and the long cardboard. Quite easy to handle and were also fixed in the house floor. Then the normal-sized carton packed and also quickly over the 3 stairs steps into the house. But then the big cardboard. Thought Thomann yes, plastic handles in a cardboard box I've never seen. So zack, raise and oh ... but heavier than imagined. 10 meters to the front door and New Year's Eve I did not want to go through, because of back pain, in the chair. So short hand the jack-up of the motorcycle snapped (has two roles) and the "package" da drauf. Moving on to the stairs and the 3 steps, was now no problem. In the house then again arrived, it went to unpack. The first fear that the contents in the deformed carton was damaged disappeared as I opened it and came across the two 10-meter-long loudspeaker cables. In the normal-sized carton were, as expected, the top parts. In the longboard the two loudspeakers were for the top parts and in the big cardboard box, what else could it have been, the sub. The top parts are super processed, I saw no quality deficiencies, even in the paint. At the upper rear edge is a stable metal handle. On the back is a Speakonbuchse and over there a sliding switch to raise the heights by +3 dB. On the underside are four rubber feet, to ensure that the box does not slip during a possible standing operation. The complete loudspeaker is in black, only the "The Box" logo on the front has a light color. The sub is also super-processed. It has on both sides a large handle which can be "attacked" by four directions. On the back is the 3-way amplifier installed. As input, he has a XLR / 6,3mm jack combi socket and a cinch socket for right and left. As output, he has two Speakon sockets for the top parts and two XLR sockets for a possible loop-through of the signal. In addition, a main and a sublevel rotary control is installed, a cold plug connector and a toggle switch for switching on and off. In addition, the amplifier has a power and an override LED and a! Temperature-controlled! Fan that even turns off completely when it is not in use, is still on. To the whole technical it still has four rotatable wheels on the back and a metal edge at the bottom, so that the painted wood does not take any damage during the tipping over. Down below are four glove feet, and on top is a hole for a boxing pole. The tripods are delivered together in a practical carrying bag, fulfill their purpose and have the feature that they slowly lower as soon as one pulls the securing bolt and loosens the screw. The cables are gray and have two ends;) The handling is precisely described on the connectors. At his first site, the plant had to show immediately what it has on it. Why? Because the outside was used. At first I thought that the 15 inches might be too small to be a complete garden ... But my thought was dwindling, when I had then really turned up! Even 30 meters away, the bass was still perfectly pronounced and balanced. But another problem came, which I had not expected at all. And indeed the top parts began to scratch at very high volume. So, a little quieter and the bass on the EQ from the desk. To this, the main controller was at 40% and the sub controller at 100%. The area convinced me from front to back. More is really not to say except that the money is REAL! For the price more than good! I bought the set in February 2015 directly in Treppendorf. The plan was actually to buy two 15 "Mufu active boxes. Then followed the rehearsal at Thomann. The previously selected (Samson) were absolutely not satisfactory, the own brand of Thomann went so, but was not soo convincing. Then the nice coworker, more from fun, times on the CL112 bundle switched. A bit surprised, whether the good sound, I asked him to switch to the 115 set. The sound in the test room of the previously heard in the striking (very low) price class by far the best impression. After a look at the price tag (at that time 548EUR) was clear, that is bought. Now the set was in the last half / three quarter a few times on different occasions in the employment and I am still very satisfied. The set was designed primarily for use on parties with preserves. In this area I did not expect any problems - and never had any. 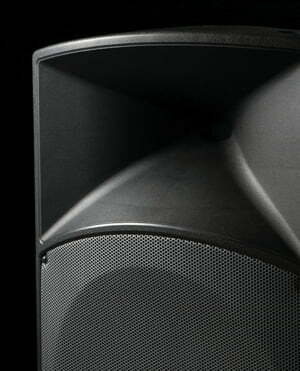 Smaller private parties of up to 50 people can be heard more than neatly. I was not quite so sure when I was working for livemusik, also in the context of 20-100 people. 8 "tops from the price class I initially did not consider as suitable for singing + (E-) guitar with higher volumes. 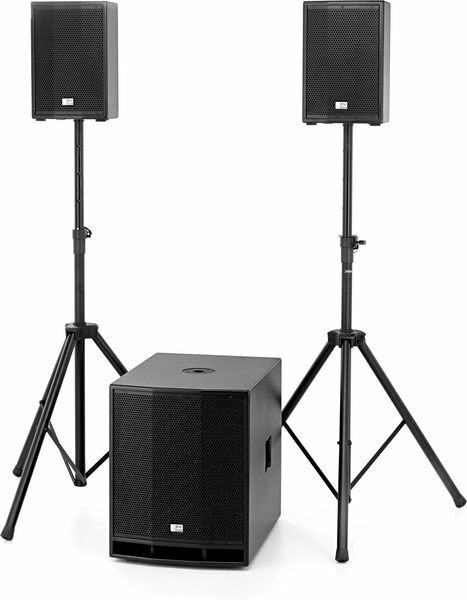 Also the subwoofer I did not trust so much anymore, because 220W are now not the force, especially since a single 15er sure Is not the first choice for a band with drum kit and bass. Contrary to the fears, the set also mastered everything without problems. The tops bring a very usable sound, vocals and guitar sound great! Also the sub goes neat to works, the taken kick-drum comes very pressurefully and clean over. Also E-bass sounds very good over the area, not boisterous yet powerful. Even very violent synth-keyboard-basses in enormous volumes (drowned a loud drums in a-dampened-garage - everyone had ear protection in the zoom and H2 hats the built-in microphones, despite gain on low and low leveling) were no problem - amazingly. With this action, the plant has worked far beyond the boundaries I have given her, and still delivers a very useful sound. I have counted with clearly shrieking tops and an overstretched sub - both were not the case! For this I have to say that in the live assignments so far always a Yamaha 01V was used, so that in case of an emergency, dynamic kicks could be caught at the desk. It was absolutely necessary not so far, but it did not hurt. In general, I have not held so much of the cheap housemark sets and have already worked with "official" material, so Seeburg, RCF, HK Premium etc. are also familiar to me. From the cheaper price class I had more often an older Behringer set (2x 12 "Tops, 2x 18" Subs) under the fingers, which I found absolutely horrible and find. The CL115 set is much better. Certainly not directly comparable with RCF (the stuff has more reserves and the same noise is less) but the distance is much smaller than expected. -a limiter is, contrary to most statements, not available - only a Protect (protection) circuit, which however also jumps in, when the system is really already quite a bit above the limit (I personally have not yet experienced). With a limiter I would personally feel much more comfortable, especially if I lend the plant times in the friend circle (to laymen). In summary, you can say that you get a very good PA set for the money, that makes on smaller, rather private events a good figure. So if you are looking for a maximum of 100 people, this facility should definitely look. With individual components you are usually more flexible.